The shrine of Hazrat Nizamuddin Auliya in Delhi is one of the most important Sufi shrines in the world. 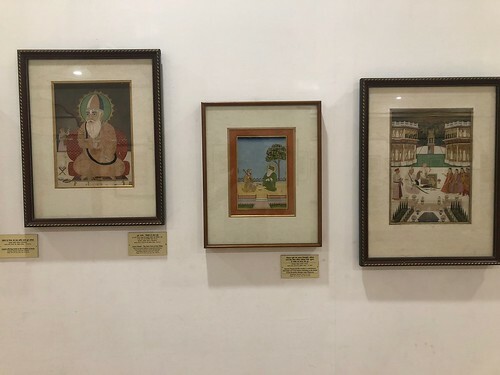 Not only does it attracts Sufi pilgrims and devotees from everywhere, it also fills up with qawwali music lovers, all sorts of spiritual seekers, and curious travellers interested in Indian history and culture. The place is home to dozens of graves, but the most famous tomb here, after the one of Hazrat Nizamuddin himself, is arguably that of great poet and musician Amir Khusro. Amir Khusro, indeed, was a fervent disciple of Hazrat Nizamuddin and had asked to be buried close to his master. Many of us have visited the resting places of these two major figures of our city. But who knows what they looked like? No image of them is to be found inside the dargah— Islam traditionally doesn’t encourage depicting the likeness of people. But there exists a place in Delhi where you can study in great detail the faces of both these men. Head to the National Museum and go straight to the painting section. 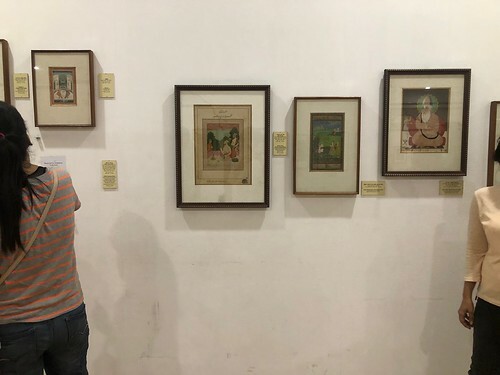 The framed artwork hangs in one of the three galleries. Hazrat Nizamuddin is seated under a fruit-heavy mango tree, one of his feet casually placed over his loose green robe. The 14th-century Sufi saint is shown with a long bushy white beard and a halo around his head. The much younger Amir Khusro is sitting in front of him. 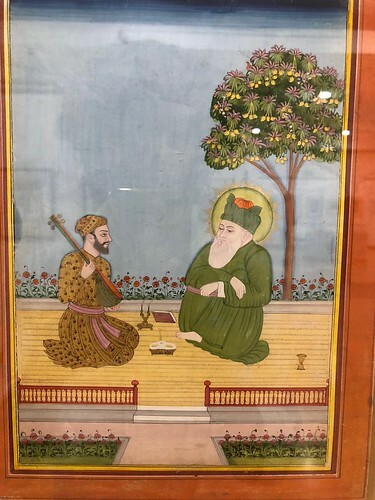 Dressed in a flowery costume, he is holding a sitar and staring straight at Hazrat Nizamuddin, whose eyes are cast downwards as if in deep appreciation — or melancholy. Just looking at the picture one can feel Khusro’ affection and respect for his Hazrat. 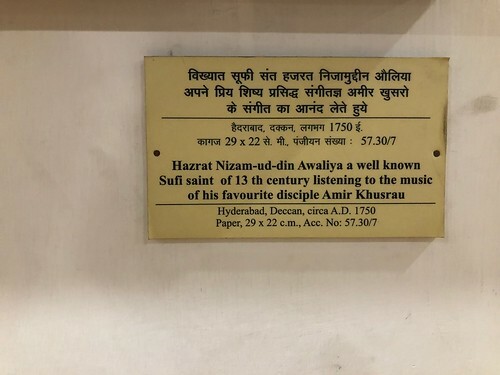 The accompanying plaque explains that the Sufi master is listening to Khusro’s music. Also depicted: a book and a sand-clock placed beside the two men. The garden pavilion in which they are sitting is lined with what appears to be a row of roses. The painting was drawn on paper by an unknown artist in Hyderabad around 1750. Obviously, there is no evidence at all that the illustrated portraits resemble their original models — after all, they were painted several centuries later. 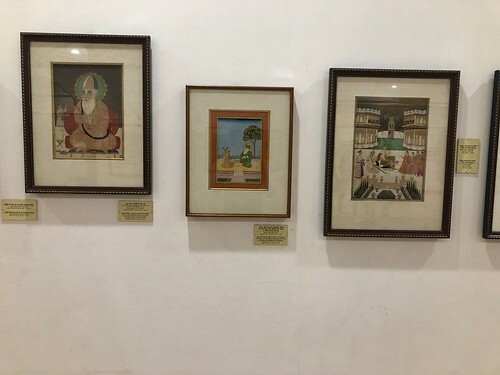 And yet, it is something to spend time with this painting, looking at these faces and immersing oneself in this atmosphere, for this might be the closest you can get to some visual impression of the Sufi saint and the witty bard, two of our greatest Delhiwallas.